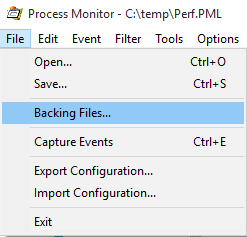 In this post I will cover a few tips for getting started with using ProcMon (Process Monitor in the Sysinternals Suite) for troubleshooting long running processes. Note that I am not an expert in ProcMon by a long shot, so this is more of a selfish post to remind myself of some key settings to be sure to configure. Side note. You can run the Sysinternals tools from the web at Sysinternals Live without needing to download the tools to your local machine. This is useful if your customer / organization doesn’t allow installing / running 3rd party tools or has concerns about running them directly on a machine. Skip down to the Tips section if you don’t want to read the back story. At least once a month I have a customer scenario where two or more applications are not playing nice with each other. A .Net website and anti-virus software, SharePoint and server backup software, etc. Usually the problem involves one piece of software placing a write-lock or exclusive hold on a file / registry entry while the other software expects the same. In such a scenario we need to monitor a file / registry entry from a fresh start (restart application pool, process, etc.) until the file / registry access error happens which could be hours or days. Since we are monitoring for such a long time we want to make sure that ProcMon only captures the data that we need as well as be mindful of memory / disk space usage. 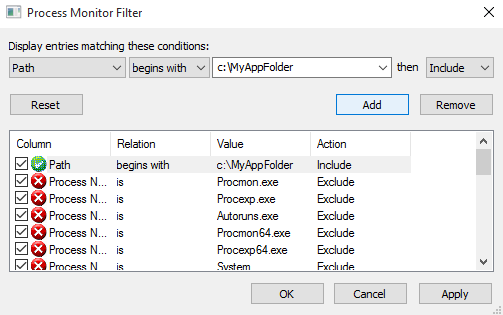 If you start up ProcMon by double clicking the executable ProcMon will start capturing data immediately. Instead launch it from the command line with the /noconnect parameter. 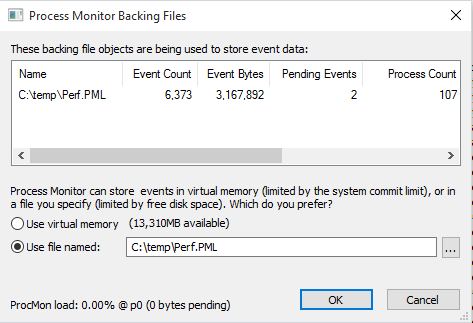 By default ProcMon will store event data in virtual memory. Since we could capturing hours or days worth of data it might be preferred to store that to a disk with lots of free space (multiple GBs or more depending on expected duration and number of events). Navigate to File –> Backing Files… for these settings. Change the radio button from “Use virtual memory” to “Use file named:” and then specify the filename you would like to use as a backing file. .PML is the default extension used so I followed that convention. 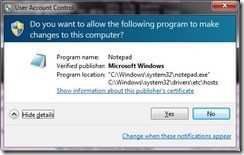 By default all processes accessing any files and / or registry locations will be monitored. Instead we want to filter events based on our criteria. The most common scenarios that I run into (in order that I see them) are 1) filtering for location when we don’t know the process that is locking it or 2) filtering for a specific process when we know the process but not the location that is being locked. Click on the filter icon in the top menu or click Filter –> Filter… to access these settings. In the example below we filter for any path that begins with “c:MyAppFolder”. 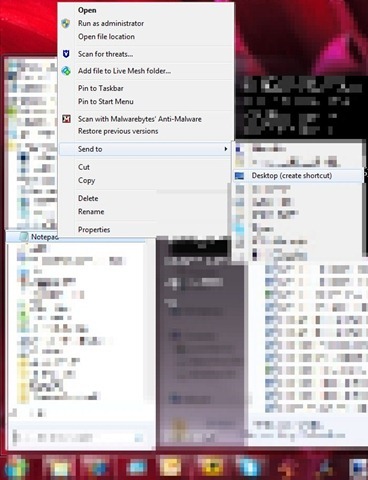 By doing this we include any subfolders of our application folder. By default ProcMon will capture all events whether they are filtered or not. To save on memory (or file space if you use a backing file) you can drop filtered events. There is a chance that if you created your filter incorrectly you may miss the events needed for troubleshooting but by keeping your filter broad enough that shouldn’t be an issue. 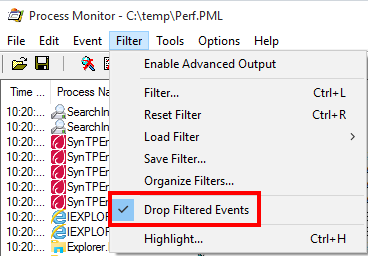 Click on Filter and select the Drop Filtered Events menu item. If there is a check mark next to the menu item then you have correctly configured ProcMon to drop filtered events. In this post I walked through a few quick tips for configuring ProcMon when you need to troubleshoot a long running process. Hopefully these tips will help you avoid out of memory issues or having to parse through hundreds of thousands of events. Special thanks to my peer and teammate Ken Kilty for providing the research and background info for this blog post. Please see the following Microsoft support article for resolving this issue. 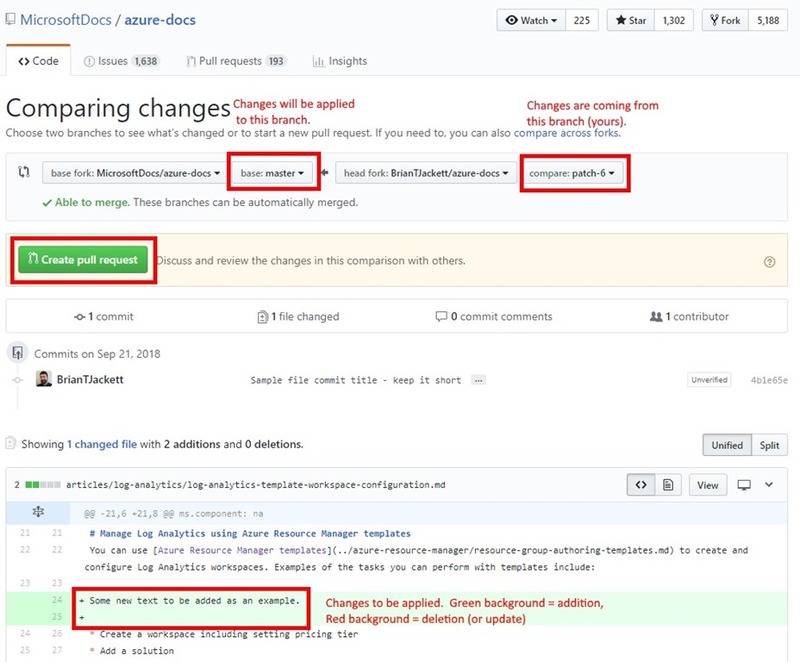 <Update 2015/7/28 2:30pm> I received clarification that the SharePoint product group does support installing .Net 4.6 onto an existing SharePoint 2013 farm server. It is the installer for SharePoint 2013 that will fail to detect .Net 4.5 if .Net 4.6 is already installed and thus throw an error. A future update should correct this scenario with the installer. On a related note I was able to successfully uninstall .Net 4.6 from a server (remove the KB as mentioned at bottom of this post) and then install SharePoint 2013. Quick publish on this item and I’ll update once I have more details. One of my customers is exploring Visual Studio 2015 / .Net 4.6 which was just released a week or two ago. 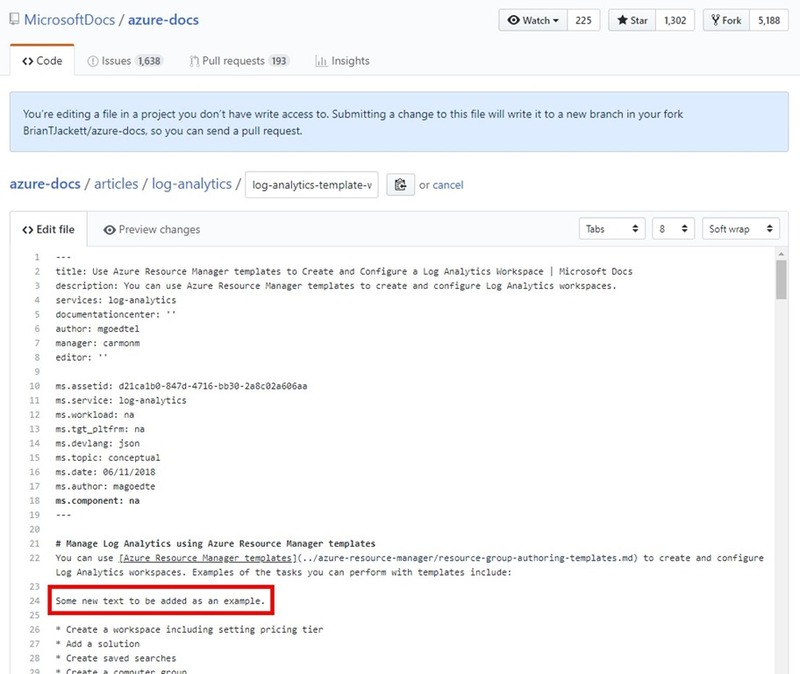 During some testing I found out that (as of July 28 2015 when this is published) you cannot install SharePoint 2013 binaries onto a server that has .Net 4.6 (or Visual Studio 2015 which includes .Net 4.6) installed. I received the below error message. 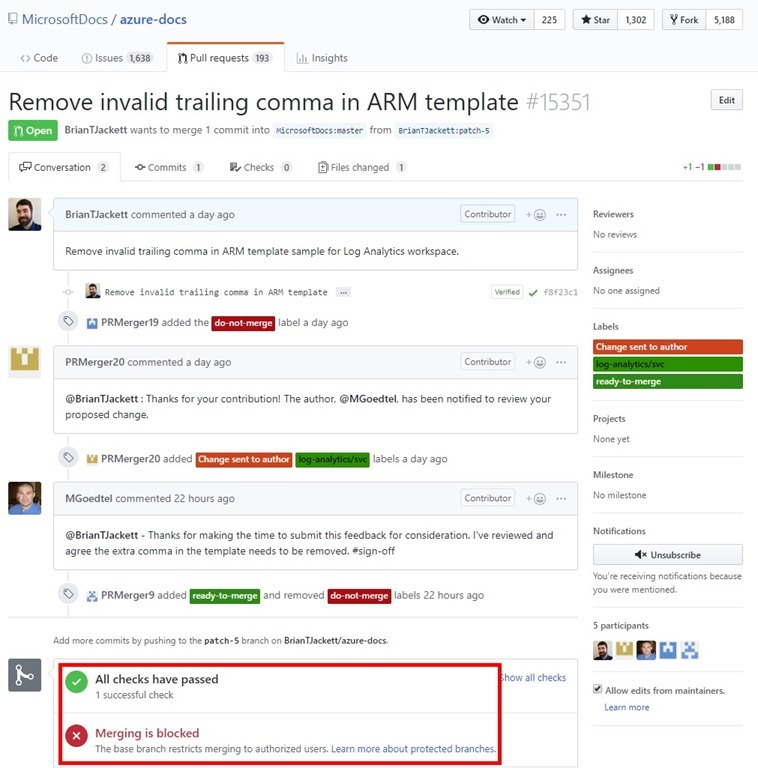 Since .Net 4.6 is an in-place upgrade of .Net 4/4.5/4.5.1/4.5.2 SharePoint has an issue with finding .Net 4.5.x after applying 4.6. I am testing out removing the associated KB for .Net 4.6 to see if this is reversible should you accidentally deploy this to a dev / test farm. 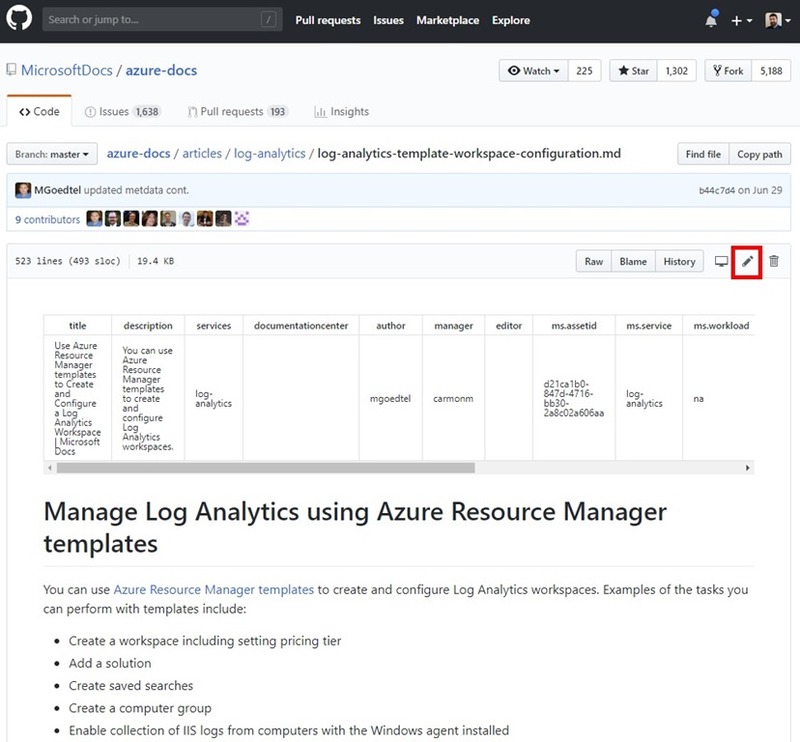 I’m also testing if you can install .Net 4.6 / Visual Studio 2015 onto an existing SharePoint 2013 farm. On Windows Vista SP2 / Windows 7 SP1/ Windows Server 2008 SP2 / Windows Server 2008 R2 SP1, you will see the Microsoft .NET Framework 4.6 as an installed product under Programs and Features in Control Panel. On Windows 8 / Windows Server 2012 you can find this as Update for Microsoft Windows (KB3045562) under Installed Updates in Control Panel. On Windows 8.1 / Windows Server 2012 R2 you can find this as Update for Microsoft Windows (KB3045563) under Installed Updates in Control Panel. Hopefully this helps someone before they run into issues with their farm. Feel free to leave a comment if you find out any additional details or workarounds. Registration for Stir Trek: Thor Edition opens at 12:00am “Thors”day March 17th. Stir Trek is now in its third year and this is the second year I’ve helped with planning. For those unfamiliar the Stir Trek conference here is the description from the website. You don’t have permission to save in this location. Contact the administrator to obtain permission. The error above is caused by the program you are using to edit the HOSTS (Notepad in my case) isn’t running in “Run as Administrator” mode while trying to modify a system file. As a result it will ask you to save to a location (My Documents) that it does have access to. Unfortunately we do need to save it to the original location. For those unfamiliar, the HOSTS file is used to locally map hostnames to IP addresses and will supersede values that come from Domain Name System (DNS). As a developer I use the HOSTS file to point my local machine to a development environment that isn’t registered in DNS or perhaps a specific server in a load balanced server farm. Yes you read this section title right, I came up with multiple solutions (2 1/2 really) to this issue. If you prefer to see me dazzle you with my PowerShell skills skip ahead to solutions #2 and #3. If you’d like the old-fashioned “by hand” solution check out #1 below. As stated above, the first solution I would consider more of a manual approach. The first thing you will do is create a shortcut to your favorite text editing software. Since Notepad comes with just about every Windows OS I chose that for simplicity. 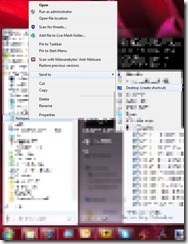 One way to create the shortcut is to find it in the All Programs of your Start menu and Right Click –> Send To –> Desktop (create shortcut). When calling Notepad from the command line it is possible to specify the file to open automatically by listing it as a command line argument. If your text editor doesn’t support this you’ll need to find an alternate approach. Once you have the created the shortcut edit the properties by Right Clicking the shortcut and choosing Properties. You will need to add the file location of HOSTS (%windir%system32driversetchosts) to the value already in the Target box shown below. After you have added the file location to Target click the Advanced button in the lower right shown below. 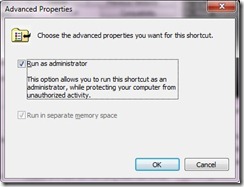 On the advanced properties window you’ll want to check the box for “Run as administrator” which then allows you to edit the HOSTS file when opened in Notepad. Click OK. 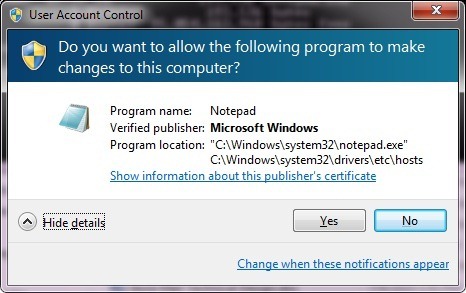 If everything was successful when you double click the shortcut you should be prompted by a UAC box (because we chose to Run as Administrator) that lists the program (Notepad) and the file location (HOSTS file) to be opened. Click Yes. 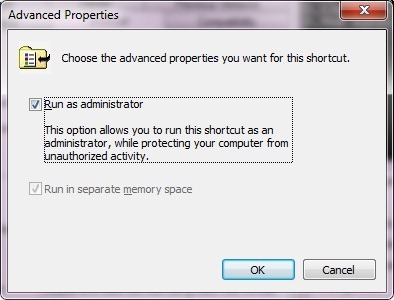 The first PowerShell solution automates the process of creating the desktop shortcut but with one drawback: you still need to manually set the shortcut to “Run as Administrator”. Just follow the steps from Solution #1 to add that additional piece. Note: You’ll notice that I commented out the line to assign a hotkey. I was using that hotkey as a 3-button quick test of my script results instead of multiple clicks to return to the desktop, find the shortcut, and click it. Feel free to uncomment and use it permanently, just be sure you don’t already have a hotkey mapped to that key combination. Since I couldn’t find a way to automate the setting for “Run as Administrator” in Solution #2 I continued my pursuits by “thinking outside the box.” I thought if I can’t set that property perhaps I can launch the process in elevated mode instead. (Sidenote: anyone familiar with Mythbusters, one of my favorite TV shows, may recognize their philosophy of attempting to recreate the results without necessarily adhering to the exact circumstances originally proposed.) As a result what I ended up with was a shortcut on the desktop that actually runs a PowerShell command that in turn opens the HOSTS file in “Run as Administrator” mode. While I do appreciate that I was able to get the results I wanted there are a few things that I don’t like about this solution. First is that I had to hardcode the “C:…” file location for HOSTS. While a large percentage of users will have their Windows folder on the C: drive, not all will (especially one of my home machines where Windows is on the W: drive.) Technically I could overcome this with enough string manipulations, but I didn’t have time to mess with it. The second issue is that I have an intermediate step of launching the PowerShell console which then runs the open Notepad command. The PowerShell console only shows for a second or two and uses minimal resources but it’s definitely not as efficient as it could be. So there you have it, 3 different ways to quickly and easily launch the HOSTS file in a save-able manner. The first two solutions have a minor amount of manual steps required while the third is fully automated but with the drawbacks that I pointed out. 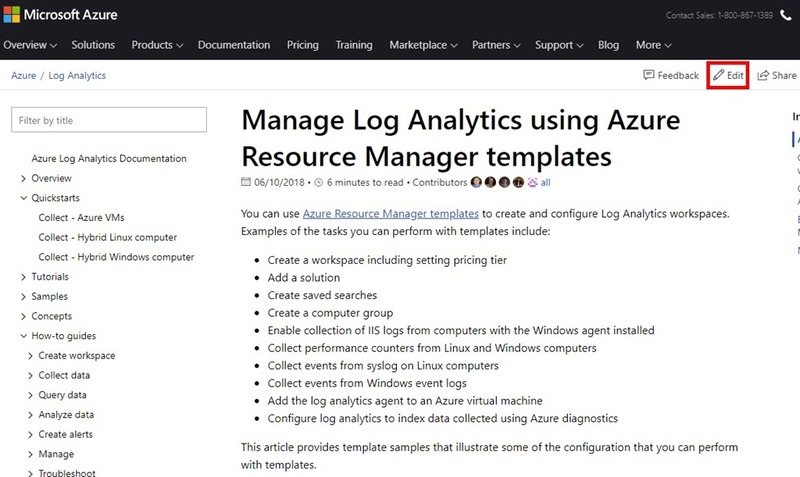 If anyone reading this knows a way to assign the “Run as Administrator” property through PowerShell I would very much appreciate a link or resource. I spent a good chunk of time researching but came up empty handed. I hope you were able to gain something useful from this post. I know I had a great deal of fun researching for it.